Background: Acute diarrhea is the major cause of child morbidity and mortality in low-income nations. It is the second most common cause of death among children <5 years of age globally. The indispensable role of community pharmacists is clearly observed in the prevention and treatment of diarrhea. However, there is a paucity of data on how community pharmacies manage acute childhood diarrhea cases in Ethiopia. This study aimed to evaluate the experience of community pharmacies in the management of acute diarrhea in northern Ethiopia. Methods: A simulated case-based cross-sectional study was conducted in community pharmacies from five towns of northern Ethiopia between April 2015 and September 2015. Convenience sampling technique was used to select sample towns. A structured questionnaire was organized to collect the information. Descriptive statistics, chi-squared test, one-way analysis of variance, and binary logistic regression were performed to describe, infer, and test for association between the variables. SPSS for Windows Version 21 was used to enter and analyze the data. A 95% confidence interval and P-value of 0.05 were set to test the level of significance. Results: Approximately 113 community pharmacies were visited to collect the required data from five towns. Majority (78, 69%) of them were located away from hospitals and health care areas. Nine components of history taking were presented for dispensers. Regarding the patient history, “age” was frequently taken, (90.3%), whereas “chief complaint” was the least to be taken (23%), for patients presenting with diarrhea. Approximately 96 (85.0%) cases were provided with one or more medications. The remaining 17 (15%) cases did not receive any medication. A total of six pharmacologic groups of medications were given to alleviate acute diarrheal symptoms. Majority (66, 29.6%) of the medications were oral rehydration salts with zinc. The mean number of medications was 1.99 per visit. Components of advice, such as dose, frequency, duration, drug action, and adverse drug reactions, were found to vary among the five towns at a statistically significant level. Conclusion: Community pharmacies provided inadequate treatment for acute childhood diarrhea. Inappropriate history taking and incorrect drug and food instructions have been frequently encountered during acute diarrhea management. Practitioners working in northern Ethiopia should receive proper training on the management of acute childhood diarrhea. Discharge of loose stools more than three times per day for not >3 weeks is considered to be acute diarrhea.1 It is the second most common cause of death among children <5 years of age globally. Southeast Asia and Africa harbored 80% of diarrhea cases.2 According to the World Health Organization (WHO) report, Africa accounted for 98.2% of the total global acute watery diarrhea (AWD). Acute diarrhea is emerging as a major public health issue and development challenge in poor countries.3 Low-income countries such as Ethiopia are suffering from diarrhea epidemic due to poor prevention through personal hygiene, lack of skilled man power to treat the epidemic, and lack of medications. Approximately one of every five deaths every year in Ethiopia has been due to diarrheal disease in the past 10 years. Its occurrence is highest particularly in children <2 years of age.4 This is due in part to declining level of maternal acquired antibodies after holding breastfeeding.4 Active immunity in the child is still not matured to defend pathogenic antigens. Children of this age group are exposed to contamination with feces when they start to crawl.5 Death from acute diarrhea arises from complications such as dehydration and acidosis. However, it can be ultimately prevented by supplementing oral and parenteral rehydration, depending on the extent of fluid and electrolyte losses. The WHO recommends increased fluids and supplemental zinc for 10–14 days to prevent dehydration.6 Antibiotic therapy directed at the specific pathogen is also recommended. Rehydration and antibiotic therapy are frequently initiated by community pharmacists who do have the mandate to exercise these activities in a certain community. Indispensable role of community pharmacists is clearly observed in the prevention and treatment of diarrhea and the associated problem of dehydration in children.9 They play a pivotal role in the management of acute diarrhea and referral of complicated and advanced cases to higher health facilities for laboratory investigation and intravenous resuscitation. However, the treatment protocol of acute diarrhea is ever changing. New guidelines are published every day in the world. Community pharmacists are not able to access those guidelines due to remote geographical locations of pharmacies. Procedures to update pharmacists’ knowledge are also not well established. Hence, pharmacists are forced to manage diarrheal disease using old trends. Research from developing countries showed that dispensers working in community pharmacies rarely possess the adequate knowledge and skills for effective disease management.10 Poor history taking, inadequate information provision, poor consultations, and poor case management of childhood diarrhea were found to be the common shortcomings of pharmacists and pharmacy staff in both developed and developing countries.7 To date, emphasis is not given for the role of community pharmacists in the management of common health problems, including diarrhea cases. Capacity building including the supply of guidelines and trainings to fill the knowledge gap of pharmacist was undermined. Strengthening the power of these pharmacies requires a great area of concern. Training of community pharmacists on the management of common disease states was occasionally carried out. Moreover, these interventions were not comprehensive enough to include acute diarrhea, which is the most prevalent common public health problem. These short-term trainings were also not inclusive of all community pharmacists. The Federal Ministry of Health, Ethiopia, has set out National Acute Water Diarrhea Prevention and Control Strategy to free Ethiopia from AWD by the end of 2015. However, the strategy was not fully implemented, and the majority of the activities were limited to the central part of the country.3 There is a paucity of data on how community pharmacies manage acute childhood diarrhea case in Ethiopia. 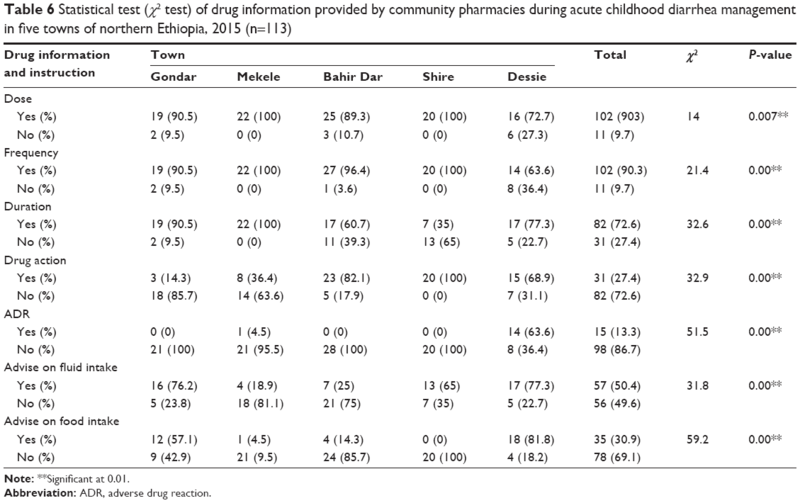 This study aimed to evaluate the experience of community pharmacies of history taking, medication recommendation, and drug information provision for hypothetical acute childhood diarrhea in northern Ethiopia. This study was conducted in northern Ethiopia. Ethiopia is a low-income country located in the Horn of Africa. Community pharmacists and druggists who were working in selected community pharmacies were included in the study. The study populations were all community pharmacy outlets in selected towns. The study sites were selected based on the number of patients encountered by community pharmacies and the geographical locations of pharmacies in the northern part of the country. Accordingly, the data were collected from five towns of Amhara and Tigray regions. Two cities in Tigray regional state, namely, Mekele and Shrie, were studied. The two towns were found to host many cases of diarrhea from Affar and Humora, respectively. In Amhara region, three towns, including Bahir Dar, Gondar, and Dessie were taken. The last three towns were having a large population. These three towns have large population sizes and have hospitals serving as referral institutions for patients from neighboring towns (Figure 1). Figure 1 Geographical locations of study sites. 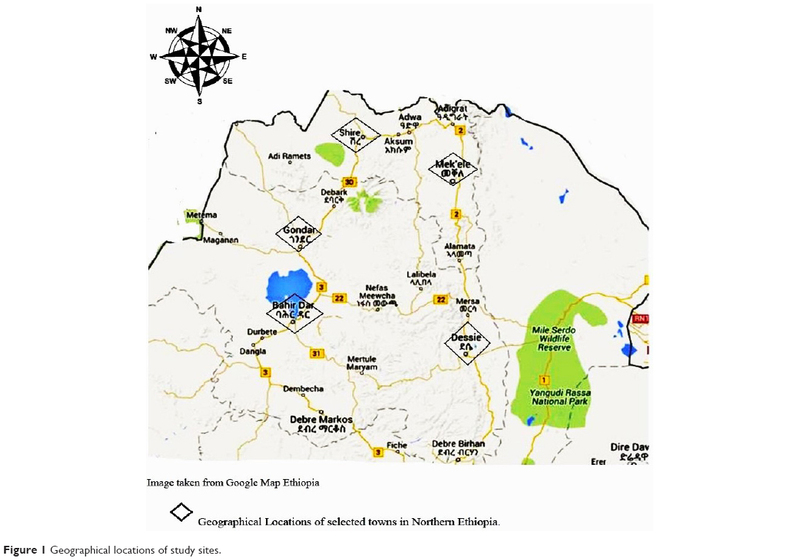 A simulated case-based cross-sectional study was conducted in community pharmacies from five towns of northern Ethiopia between April 2015 and September 2015. Location of pharmacies in a town, types of dispensers, and the study towns were regarded as independent variables, whereas medication recommendation and information provided to customers, instructions on food and fluid intake, history taking, and outcome from visit were the dependent variables. Considering the higher proportions of patient load and based on the geographical location of the community pharmacies over the regions, five sample towns were selected from two regional states of Ethiopia. Convenience sampling technique was used to select the sample towns. All pharmacies in the study towns were included to collect the required data. Data were collected by all the investigators who were working as instructors at University of Gondar. Ethical clearance was obtained from the Ethical Review Committee of School of Pharmacy, College of Medicine and Health Sciences, University of Gondar. A structured questionnaire was prepared to collect information on the knowledge and practice of community pharmacists in the management of AWD in children <5 years old. The protocol for assessing the practice of pharmacists regarding evaluation of patients, treatment, and instruction on food and fluid intake was taken from WHO guideline information for pharmacists.2 Data collectors were trained on simulated patient case by the principal investigator as if they were close relatives of under-five children. They went to community pharmacies with dispensers on duty and asked for medication for their child. They were also informed on how to interact with the pharmacists and what answers to give for anticipated evaluation questions on the history of present illness. The data were checked for consistency and completeness every day on the sites by the investigators. Data entry and analysis were done using SPSS Version 21 for Windows. Descriptive statistics, such as frequency and percentage, were performed to determine the number of pharmacies in each city, group of drugs recommended, and other findings. Mean and standard deviations were computed to describe the difference in drug information provision, group of drugs dispensed, and history taking between towns. Likelihood ratios were applied to interpret the results of χ2 test. P-value was set at 0.05 with 95% confidence intervals (CIs) to test statistically significant difference and association between variables. Mean square values, F-test, and P-values were used to report the inference. Logistic regression was found as an appropriate statistical method done to test whether dispenser qualification, location of pharmacies, and town in any place affect the extent of community pharmacies giving drug for each case visit. The study was approved by the ethical review committee of the School of Pharmacy, College of Medicine and Health Sciences, University of Gondar. Away from hospital: it is the location of pharmacies where the pharmacist is not able to refer the patient in case it is necessary. Outcome from visit: the type of interventions provided by community pharmacies. Dispenser: anyone including pharmacist, druggist, pharmacy technician, or salesperson who was working at community pharmacies. Community pharmacy: an establishment retailing medicines which is managed by a pharmacist registered with a relevant body and licensed to dispense medicines for humans and compound prescribed preparations. Approximately 113 community pharmacies were visited to collect the required data from five towns. The simulated visits to all the pharmacies were included in the final analysis. Twenty-two pharmacies were taken from Mekele, which is located in Tigray regional state. In the same regional state, 20 pharmacies were visited from Shire. In Amhara regional state, a total of 71 pharmacies were included from three towns, namely, Bahir Dar (28), Dessie (22), and Gondar (21). Community pharmacies were classified into two groups based on their proximity to health facilities. Majority (78, 69%) of them were located away from hospitals and other health institutions. Statistical difference was observed between the towns in the number of pharmacies located away from or near to hospitals (χ2=30.9, P=0.00). Twenty pharmacies out of 22 were located away from hospitals at Mekele. In contrast to this, a large number of community pharmacies were found close to hospitals at Shire. The number of pharmacists (45, 39.8%) was less than that of druggists (68, 60.2%; Table 1). The ratio of druggists and pharmacists was significant between the five cities (χ2=9.8, P=0.04). The ratio was highest in Bahir Dar (2.5) as compared to other cities. The least druggist-to-pharmacist ratio was observed at Mekele (0.7) (Table 1). Notes: *Significant at 0.05. **Significant at 0.01. Nine components of history taking were presented for dispensers. 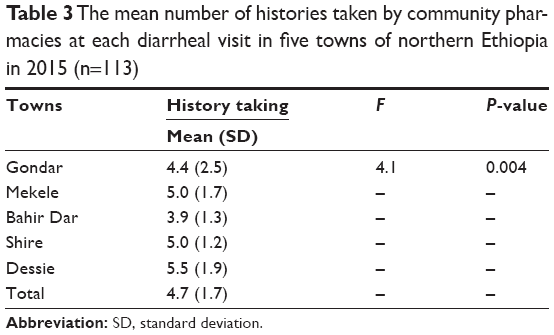 Individual history taking components that included chief complaint, weight, medication history, past medical history, age, onset and duration of diarrhea, frequency of diarrhea, presence of blood in stool, and fever have shown a significant variation in each town. Age was a frequently taken history for patients with diarrhea (90.3%), whereas chief complaint was the least to be taken (16.5%). The mean (m) number of history taking was 4.7±1.67 histories per encounter (Table 2). There was a statistically significant difference in the mean number of histories taken by community pharmacies between the towns (F=3.79, P=0.006). 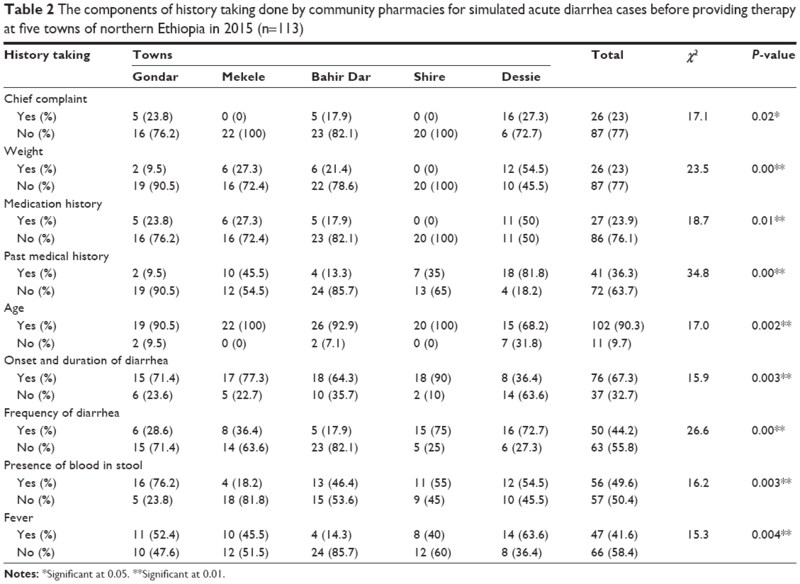 Post hoc analysis revealed that community pharmacies at Dessie (m=5.5±1.9) took more history than those at Bahir Dar (m=3.9±1.3, P=0.004) (Table 3). A total of six pharmacologic groups of medications were given to alleviate acute diarrheal symptoms. These drugs include antiamoebic, antibacterial, antidiarrheal, anthelmintic, antispasmodic, oral rehydration salts (ORS), and zinc. Specific drugs such as cotrimoxazole, metrinidazole, loperamide, albendazole, mebendazole, and hyocine were dispensed. Approximately 223 drugs were dispensed to all encountered simulated cases (Figure 2). Majority (66, 29.6%) of the medications were ORS with zinc. Nearly 90.9% of cases were managed by ORS with zinc at Mekele, which was the highest among the cities. The rate of ORS plus zinc use was only 57.1% in the case of Dessie (Table 4). Antibacterials were the second most prescribed drugs. Antibacterial prescription pattern was significantly different between the towns (χ2=40.4, P=0.00). Approximately 75% of cases were given antibacterial drugs at Bahir Dar, whereas only 18% of cases were treated with antibacterial drugs at Mekele. Based on the χ2 test (likelihood ratio), it was found that the groups of medications provided by the pharmacies were different in a statistically significant manner among the five towns except for the case of antiamoebic medicines that did not vary in such a way (Table 4). The mean number of medication was 1.99 per visit. 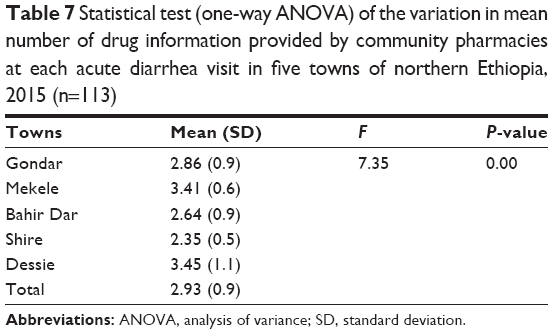 Post hoc analysis test showed significant mean differences between individual towns on the number of drugs recommended per individual diarrheal case. These variations were particularly observed between Dessie (m=2.95±1.40) and Mekele (m=1.82±0.59, P=0.001), Dessie and Bahir Dar (m=1.32±0.77, P=0.00), Dessie and Gondar (m=1.71±0.56, P=0.00), and Shire and Bahir Dar (m=2.35±0.933, P=0.001) (Table 5). Figure 2 Group of medications used to manage acute childhood diarrhea cases in community pharmacies (n=113). Abbreviation: ORS, oral rehydration salts. In the case of the spectrum of information on how to take the medicines provided by the pharmacies, all five components of advice, such as dose (χ2=14, P=0.007), frequency (χ2=21.4, P=0.00), duration (χ2=32.6, P=0.00), drug action (χ2=32.9, P=0.00), and adverse drug reactions (ADRs, P=0.00), were found to vary among the five towns in a statistically significant level. Doses and frequencies of drugs were frequently given drug information over other advice forms. On the contrary, ADR of medications was occasionally provided to clients (Table 6). The mean number components of drug information was varied between the towns (F=7.35, P=0.00). Post hoc test indicated a significant difference in the number components of drug information provided between individual towns such as Dessie (mean [SD]=3.45±1.1) and Shire (mean [SD]=2.35±0.5, P=0.00), Dessie and Bahir Dar (mean [SD]=2.64±0.9, P=0.007), Shire and Mekele (mean [SD]=3.41±0.6, P=0.01), and Mekele and Bahir Dar (P=0.01) (Table 7). Abbreviation: ADR, adverse drug reaction. Generally, advice regarding food intake was less frequently given (35) than fluid intake (57). Instructions were not given at all at Shire town on food intake. Only one instruction was provided at Mekele. In contrast, community pharmacies at Dessie and Bahir Dar advised their clients on food intake than others. Regarding fluid intake, around one-half (56, 49.6%) of them did not get any information. Incorrect information was given for 17 cases (15.0%) regarding fluid intake (Figures 3 and 4) (Table 6). Significant differences occurred in all cities with regard to the provision of food (χ2=59.2, P=0.00) and fluid (χ2=31.8, P=0.00) instruction (Table 8). 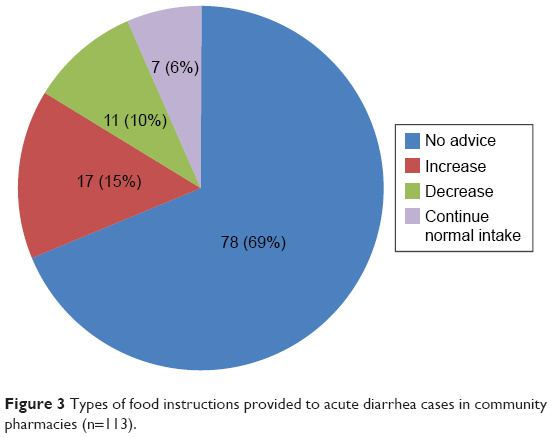 Figure 3 Types of food instructions provided to acute diarrhea cases in community pharmacies (n=113). 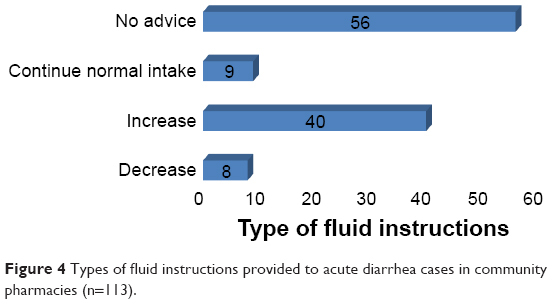 Figure 4 Types of fluid instructions provided to acute diarrhea cases in community pharmacies (n=113). Out of 113 acute diarrheal cases presented to community pharmacies, 96 cases (85.0%) were provided with one or more medications. The remaining 17 cases (15%) did not receive any medication that included both referral to nearby hospital or clinic and discharge with neither medication nor referral (Table 8). pharmacists frequently provided medications 58 (51.3%) than did druggists 38 (33.6%) (Table 8). However, in the binary logistic regression test, location of pharmacy (crude odds ratio [COR] [95% CI] =1.7 [0.59–4.91], adjusted odds ratio [AOR] [95% CI] =2.32 [0.67–2.9]) and qualification of pharmacy professionals (COR =1.1 [0.37–3.1], AOR =0.89 [0.27–2]) who dispensed medications were not found to have a statistically significant effect on the outcome of the visit. However, among the different towns in the study, pharmacies located at Shire (COR =10.86 [1.22–97.1], AOR =15.7 [1.50–153.7]) demonstrated nearly 16 times more chance for providing medications than those in Dessie town. As can be seen from Table 8, nearly all pharmacies dispensed medication at Shire. Although pharmacies in Mekele and Bahir Dar showed statistically significant predicting effects on dispensing of medicines compared to Dessie in the univariate analysis, they lost statistical significance in the multivariate analysis when controlled for confounders (Table 8). Patients either provide medication or refer to clinicians. Nonetheless, they usually prefer dispensing a regimen than referral (11.5%) (Figure 5). 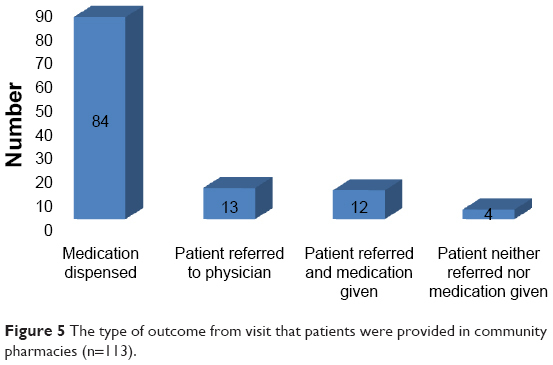 Figure 5 The type of outcome from visit that patients were provided in community pharmacies (n=113). Inappropriate counseling such as decreasing and taking normal amount was observed regarding food and fluid even though increased intake was recommended by WHO.9 Significant differences occurred in all cities concerning the community pharmacies’ provision of food (P=0.00) and fluid (P=0.00) instruction (Table 2). The communication between the patient and the pharmacist might determine the quality of instruction.25 Even though instructions on oral food and fluid intake are vital to replace the loss of nutrients during acute diarrhea episodes, the actual practice did not show dispensers’ commitment to deliver the accurate instruction. The high rate of ignorance (no advice) and misinformation (poor counseling) indicated poor management of diarrhea with nonpharmacologic treatment options such as homemade fluid and breastfeeding because caregivers treat diarrhea on the basis of health care providers’ advice.6 Similar study results also showed poor community pharmacists’ instructions on food and fluid intake.9 Diarrhea management practices were unsatisfactory in urban slums of India, where practitioners’ knowledge on history taking, drug, and food information was a strong predictor for rational management.13 In countries such as Ethiopia in which literacy level is as low as 40%, patients could not understand the role of food and fluid intake.26,27 Mothers withheld fluids, breast milk, water, tea, rice-water, and juice, during acute diarrheal illness with associated vomiting because they thought that the fluid would exacerbate the frequency of diarrhea.20,28 A community-based cross-sectional study conducted at Assosa, West Ethiopia, reported similar findings in which parents stopped feeding liquid-containing food items when their child had diarrhea.29 Community pharmacies were supposed to fill this knowledge and attitude gap of the community so that proper management of diarrhea could be achieved. However, the inadequate understanding of dispensers about the right food and fluid intake recommendations might hinder the delivery of the right counseling tip to the patient. The extent of dispensing drugs for each diarrhea case was nearly 16 times more likely at Shire (AOR =15.7, 95% CI =1.5–153.7) than that at Dessie town. As shown in Table 1, nearly all pharmacies dispensed medication at Shire. This indicated that patients were rarely referred or discharged without medication. Dispensers usually did a referral for laboratory investigations that could determine the extent of medication provision. The overall rate of medication dispensed was 96 (85%) in this study (Table 8). It was slightly higher than that in Trinidad that reported a 77.1% rate. Community pharmacies should limit the extent of drug provision to those cases with confirmed diagnosis. Incomplete and ambitious patients’ disease information should be deferred or ruled out ahead of medication recommendation. This can be achieved when management is supported by objective findings and appropriate history taking so that antibiotic exposure and resistance will be reduced. This study was a onetime survey of the management of acute diarrhea by community pharmacies. Hence, it lacked some sort of comprehensiveness to evaluate the performance of all dispensers, in case more than one practitioner was working in a single community pharmacy. Community pharmacies provided inadequate therapy for acute childhood diarrhea. Noncomprehensive history taking and incorrect drug and food instructions have been frequently observed during acute diarrhea management. Practitioners working in northern Ethiopia community pharmacies should receive appropriate training on the management of acute childhood diarrhea. The Amhara and Tigray regional health bureau could also supply updated guidelines and call these professionals for conferences and meetings to share experience among them. Information dissemination through reliable social media on the latest changes in the mode of treatment of diarrhea can significantly improve the quality of care delivered for patients. Intervention at this health care unit could substantially reduce admissions due to severe acute malnutrition, associated infections, mental retardation, and premature death of children. The authors wish to thank all community pharmacies for their contribution and further thank all the faculty members of the School of Pharmacy, College of Medicine and Health Sciences, University of Gondar. This study was not associated with any financial support. Moorthi C, Rachel P, Senthilkumar C. Knowledge of community pharmacist in the management of diarrhea in adults. Pharm Lett. 2011;3(1):364–370. Diwan V, Sabde YD, Byström E, De Costa A. Treatment of pediatric diarrhea: a simulated client study at private pharmacies of Ujjain, Madhya Pradesh, India. J Infect Dev Ctries. 2015;9(5):505–511. Federal Ministry of Health (FMOH) of Ethiopia [webpage on the Internet]. Federal Ministry of Health, Ethiopia Development of National Acute Water Diarrhea Prevention and Control (NAWDPC) Strategy. 2010. Available from: http://www.moh.gov.et. Accessed September 21, 2015. Godana W, Mengistie B. Determinants of acute diarrhoea among children under five years of age in Derashe District, Southern Ethiopia. Rural Remote Health. 2013;13(2329):1–11. Nigussie WD. Patient counselling at dispensing of medicines in health care facility outpatient pharmacies of Bahir Dar City, Northwest Ethiopia. Sci J Public Health. 2014;2(2):126. Emily C, Jennifer B, Jamie P, Holly N. Harmful practices in the management of childhood diarrhea in low- and middle-income countries: a systematic review. BMC Public Health. 2015;15:788. Pham DM, Byrkit M, Pham HV, Pham T, Nguyen CT. Improving pharmacy staff knowledge and practice on childhood diarrhea management in Vietnam: are educational interventions effective? PLoS One. 2013; 8(10):e74882. Chisholm-Burns MA, Kim Lee J, Spivey CA, et al. US pharmacists’ effect as team members on patient care: systematic review and meta-analyses. Med Care. 2010;48(10):923–933. Ogbo PU, Aina BA, Aderemi-Williams RI. Management of acute diarrhea in children by community pharmacists in Lagos, Nigeria. Pharm Pract (Granada). 2014;12(1):376. Hussain A, Ibrahim M. Management of diarrhoea cases by community pharmacies in 3 cities of Pakistan. East Mediterr Health J. 2012;18(6):635–640. Golnaz V, Azadeh E, Neda E, Moein M, Maryam M, Nazanim E. Management of acute diarrhea. 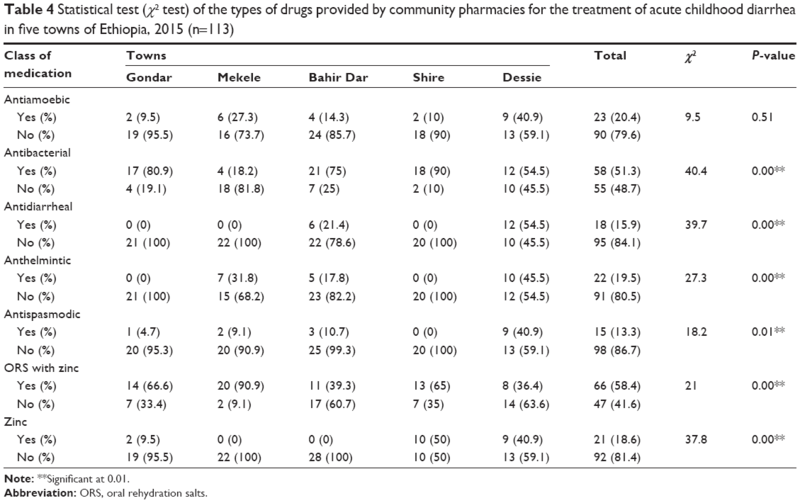 A study on community pharmacists’ attitude in Iran. Rev Recent Clin Trials. 2015;10(2):155–160. Karim R, Ramdahin P, Boodoo JR, Kochhar A, Pinto Pereira LM. Community pharmacists’ knowledge and dispensing recommendations for treatment of acute diarrhoea in Trinidad, West Indies. Int J Clin Pract. 2004;58(3):264–267. Tanmay M, Sanchita M, Barnali B, et al. Predictors of rational management of diarrhea in an endemic setting: observation from India. PLoS One. 2015;10(4):1–13. Hussain A, Izham Mohamed Ibrahim M, Malik M. Impact of training of dispensers on case management of acute respiratory tract infections at community pharmacies in Pakistan. Pharmacol Pharm. 2012;3:485–491. Saengcharoen W, Sanguan Lerkiatbundit S. Migraine management in community pharmacies: practice patterns and knowledge of pharmacy personnel in Thailand. Headache. 2013;53:1451–1463. Minh PD, Huong DTM, Byrkit R, Byrkit R, Murray M. Strengthening pharmacy practice in Vietnam: findings of a training intervention study. Trop Med Int Health. 2013;18(4):426–434. Akwagyriam I, Goodyer LI, Harding L, Khakoo S, Millington H. Drug history taking and the identification of drug related problems in an accident and emergency department. J Accid Emerg Med. 1996;13: 166–168. Federal Democratic Republic of Ethiopia DRE Ministry of Health [webpage on the Internet]. Assessment of the Pharmaceutical Sector in Ethiopia. 2003. Available from: http://www.who.int/medicines/areas/coordination/ethiopia_pharmaceutical.pdfis. Accessed September 21, 2015. Yusuff KB, Tayo F, Aina BA. Pharmacists’ participation in the documentation of medication history in a developing setting: an exploratory assessment with new criteria. Pharm Pract (Granada). 2010;8(2): 139–145. Schirm E, van den Berg P, Gebben H, Sauer P, De Jong-van den Berg L. Drug use of children in the community assessed through pharmacy dispensing data. Br J Clin Pharmacol. 2000;50:473–478. 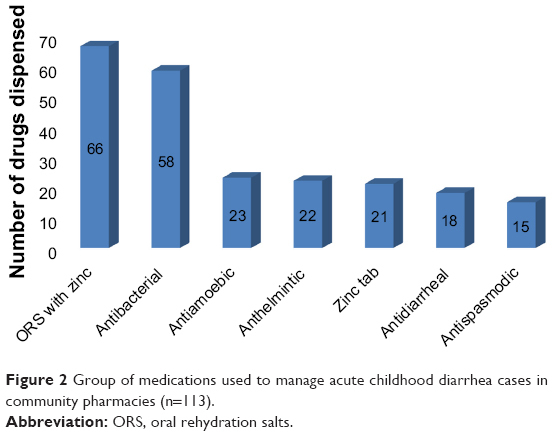 Zwisler G, Simpson E, Moodley M. Treatment of diarrhea in young children: results from surveys on the perception and use of oral rehydration solutions, antibiotics, and other therapies in India and Kenya. J Glob Health. 2013;3(1):010403. Chakrabarti A. Prescription of fixed dose combination drugs for diarrhoea. Indian J Med Ethics. 2007;4(4):165–167. Kennedy E, Moddy M. An investigation of the factors affecting community pharmacists’ selection of over the counter preparations. Pharm World Sci. 2000;22(2):47–52. Jimma LL, Biruk M, Minyahil AW, et al. 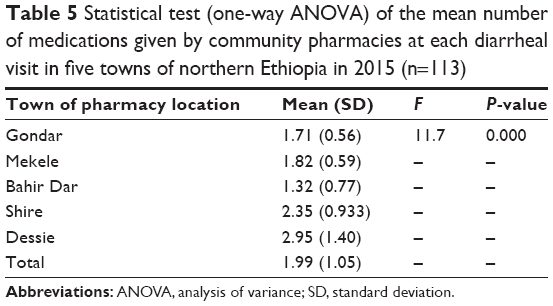 Analysis of dispensing practices at community pharmacy setting in Ambo Town, West Shewa, Ethiopia. J Community Med Health Educ. 2015;5:1. Ware KB. Prescription for progress-enhancing communication between pharmacists and patients. SOJ Pharm PharmSci. 2014;1(1):1–2. Leong C, Louizos C, Frankel G, et al. A physical assessment skills module on vital signs. Am J Pharm Educ. 2014;78(7):137. Federal Ministry of Health [webpage on the Internet]. Health and Health Related Indicators. 2014. Available from: http://www.moh.gov.et/documents/26765/0/Health+and+Health+Related+Indicators+2005+E.C/1b5b2a9f-a960-4024-8d92-519195364023. Accessed September 21, 2015. Mediratta RP, Feleke A, Moulton LH, Yifru S, Sack RB. Risk factors and case management of acute diarrhoea in North Gondar Zone, Ethiopia. J Health Popul Nutr. 2010;28(3):253–263. Available from: http://www.ncbi.nlm.nih.gov/pubmed/20635636. Accessed September 21, 2015. Merga N, Alemayehu T. Knowledge, perception, and management skills of mothers with under-five children about diarrhoeal disease in indigenous and resettlement communities in Assosa District, Western Ethiopia. J Health Popul Nutr. 2015;33(1):20–30.